VANCOUVER, BC / ACCESSWIRE / January 29, 2019 / Searchlight Resources Inc. ("Searchlight" or the "Company") (TSX-V: SRCH) is pleased to announce that Searchlight has completed the 60 day due diligence and will acquire a 100% interest in the Duddridge Lake Cobalt-Vanadium-Uranium Project ("Duddridge" or the "Property") located approximately 75 kilometers northwest of La Ronge and 400km north of Saskatoon, Saskatchewan. Searchlight has completed the 60-day diligence period during which the Company reviewed and confirmed the historical data and has begun utilizing the data for 2019 exploration planning. 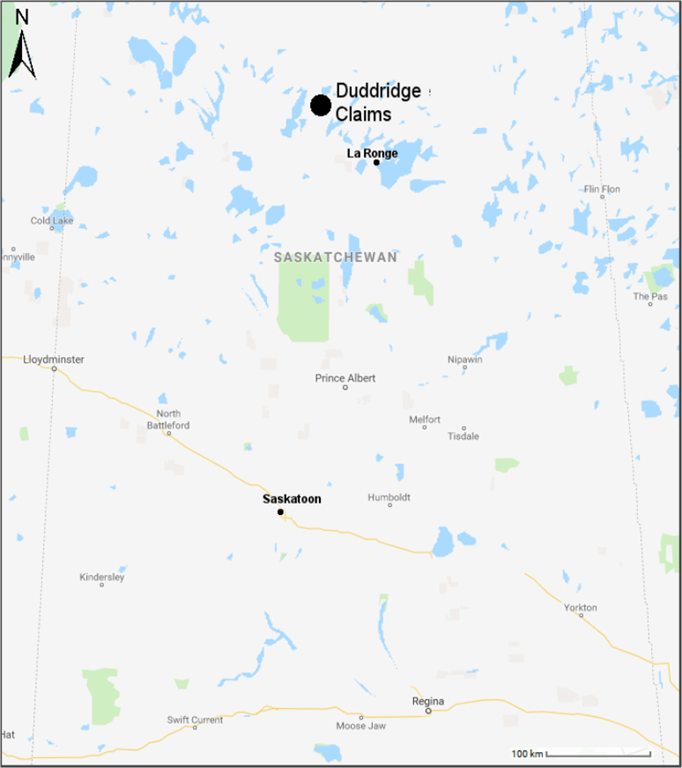 "Searchlight sees significant opportunity with the Duddridge Lake project exploring for battery minerals in Saskatchewan, one of the best Mining Jurisdiction's in the world. This combination provides our shareholders a low risk, high quality investment." notes Stephen Wallace, CEO and President of Searchlight. Mr. Wallace further noted "With the completion of the due diligence, the company looks forward to conducting field work on project in the 2019 field season"
The Duddridge Cobalt-Vanadium-Uranium Project consists of 4 mineral claims totaling 3,051.6 hectares accessible by an all-season gravel road (Highway 910) to within 12 km of the project and with direct access to the project by winter road and ATV trail in summer. Duddridge Lake fits the company focus of quality projects in Saskatchewan with access by road. To date, no exploration has ever focused on the cobalt or vanadium in this region of Saskatchewan. In 2007, Fission Energy Corporation ("Fission") announced a historical inferred resource estimate of 227,880 tonnes with a grade of 2.14 lbs/tonne U3O8 (see details below). Subsequently, during uranium exploration by Fission in 2012, a total of 39 boulder samples were collected and analyzed for a wide package of elements. The results of boulder analysis showed highly anomalous results for cobalt and vanadium, two elements that were not of widespread exploration interest in 2012. In addition, the sample results show anomalous copper, lead and uranium levels. At that time of exploration, the focus was primarily for uranium. Of note, sample DD12-HW-029 assayed 1,310 ppm Co and 1,560 V; sample DD12-SH-012 assayed 1,460 Co and 746 ppm V; sample DD12-WM-002 assayed 567 ppm Co and 5,550 ppm V plus 4,440 ppm Pb and 15,100 ppm U. Table 1 below shows the cobalt, vanadium, copper, lead and uranium assays of the 39 boulder samples collected by Fission in 2012. The data was derived from Appendix 3 of the Saskatchewan Mineral Assessment report MAW00145 submitted on March 29th, 2013 by Fission Energy Corp. Titled "2012 AIRBORNE GEOPHYSICAL SURVEYING and OUTCROP, BOULDER & SOIL SAMPLING ON THE DUDDRIDGE LAKE PROPERTY". These boulder sample results are historical in nature and Searchlight has not undertaken any independent investigation of the sampling nor has it independently analyzed the results of the previous exploration work in order to verify the results. Searchlight considers these sample results relevant as the Company uses historical reports to evaluate and historic sample results as a guide to plan future exploration programs. Under the terms of the Agreement, Searchlight will pay a 1.0 % Net Smelter Return royalty (the "NSR") to the Vendors on commencement of commercial production. Searchlight has the right, at any time prior to six months after completion of a feasibility study to purchase the first 0.5 % of the 1.0% NSR for $1,000,000 and the second 0.5 % of the 1.0% NSR for $1,500,000 for a total buyout of $2,500,000. This Agreement is subject to approval by the TSXV and a 60-day due diligence period by Searchlight. This region of Saskatchewan has been a target of uranium exploration since the late 1960's with a series of surface sampling, geophysics and drilling programs by companies including Noranda, SMDC and Fission. The Duddridge Lake Property is described as stratabound uranium and copper mineralization with abundant polymetallic mineral occurrences associated with basal quartz conglomerate and carbonaceous- bearing lenses in red bed (hematitic ) arkose. The style of mineralization present appears to have ore bearing minerals consistent with both vein type and unconformity-type deposits with nickel and cobalt arsenides. The two styles of mineralization have similarities based on association with structures, including faults and unconformities. The map below shows the area of boulder sampling in relation to known mineralization. The boulder samples represent potential up ice mineralization which will be explored by Searchlight in 2019. In addition, a second parallel 10 km long electromagnetic conductor needs to be explored. The Duddridge claims host the Duddridge Lake Uranium deposit, a 43-101 inferred resource estimate completed in 2007 by Fission Energy Corp. 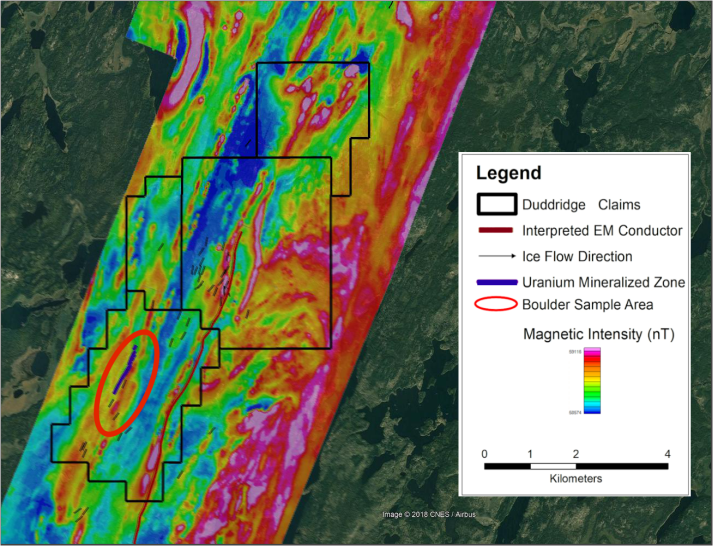 The 43-101 technical report titled "Report on the Duddridge Lake Uranium Property Northern Saskatchewan NTS 73O/9 submitted by Stuart C. Fraser, P. Geol. on June 15, 2007 reports an inferred mineral resource of 227,880 tonnes with a grade of 2.14 lbs/tonne U3O8. The Duddridge Lake Uranium deposit technical report was not commissioned or completed by Searchlight and therefore is being treated as a historical resource estimate under 43-101 disclosure. The historical resource estimate used "inferred mineral resource", which is a category of NI 43-101. As a result, Searchlight considers the historical resource estimate as reliable as well as relevant as it represents a key target for work to be done by Searchlight. Searchlight has not undertaken any independent investigation of the resource estimates nor has it independently analyzed the results of the previous exploration work in order to verify the resources and the Company is not treating the historical estimate as a current resource. This report is available on SEDAR. Searchlight Resources Inc. ("Searchlight" or the "Company") is a professional mineral exploration and development company listed on the Toronto Venture Exchange (TSXV). The company is active with mineral exploration projects in Saskatchewan, Ontario and Nevada, three of the top seven jurisdictions in the world for mining investment as ranked by the Fraser Institute. The Company holds a portfolio of gold, cobalt and base metal projects from grassroots stage to advanced exploration and NI43-101 resource development. The Bootleg Lake project is 16,900 hectares of claims in Saskatchewan covering prospective areas of the Flin Flon Greenstone Belt. Exploration is being carried out at the past producing Newcor, Rio (Bootleg) and Henning Maloney Gold mines located approximately 5 kilometres from Creighton, Saskatchewan, less than 10 kilometres from the Hudbay 777 mine located in Flin Flon, Manitoba, and in the region of the four past producing base metal mines Flexar, Birch Lake, Amisk and Coronation. The Munro Warden project is an early stage exploration prospect targeting VMS copper, nickel and cobalt within the Kidd- Munro assemblage of the Abitibi Greenstone Belt. The project covers 1,100 hectares including 9 mining leases and 11 claim-blocks located approximately 90 kilometres east of Timmins, Ontario. The Cameron project is a grassroots cobalt exploration prospect located 25 kilometres southwest of Cobalt, Ontario within the highly prospective Cobalt Embayment. Searchlight's Nevada project New York Canyon, hosts two copper deposits in the Walker Lane Structural Belt located in western Nevada; the Long Shot Ridge skarn deposit with a 2010 NI43-101 resource estimate and the Copper Queen porphyry deposit drilled out by Conoco in the 1970's. Information set forth in this news release contains forward-looking statements that are based on assumptions as of the date of this news release. These statements reflect management's current estimates, beliefs, intentions and expectations. They are not guarantees of future performance. The Company cautions that all forward looking statements are inherently uncertain and that actual performance may be affected by a number of material factors, many of which are beyond the Company's control. Such factors include, among other things: risks and uncertainties relating to the Company's limited operating history and the need to comply with environmental and governmental regulations. Accordingly, actual and future events, conditions and results may differ materially from the estimates, beliefs, intentions and expectations expressed or implied in the forward-looking information. Except as required under applicable securities legislation, the Company undertakes no obligation to publicly update or revise forward-looking information.